The number of donations worth £1m or more has increased by 19 per cent, according to the latest Coutts report into large donations. Last year there were 355 donations of £1m or more in the UK, compared with 298 in 2014, which the report described as "a significant increase". This is the first time that there were more than 300 £1m-plus donations since Coutts began collecting data in 2008. The total value of these were £1.83bn, an increase of 17 per cent on the previous year. There were no single donations of £100m or more, but the number of £10m-plus donations increased to 47 in 2015 from 34 in 2014. The highest total amount donated was £137.7m from the Wellcome Trust to the University of Oxford – this was the total for a number of grant programmes. The largest single donation was £60.75m which went to the Gatsby Charitable Foundation from Lord Sainsbury, followed by £42.88m from Sir Clive Cowdery to the Resolution Foundation. 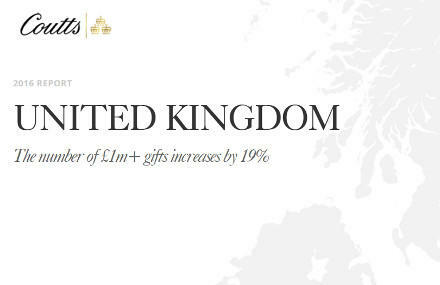 Foundations made up 55 per cent of the value of the million-pound gifts. Some 24 per cent came from individuals and 20 per cent from corporates. Higher education was the primary destination for large donations and accounted for over one-third of overall value. This is the fourth Coutts Million Dollar Donors Report which tracks large donations in the UK, USA, Middle East and Europe. Worldwide the value of individual donations worth more than $1m more than trebled. In 2015, there were 2,197 donations, worth a combined $56bn. One donor in the Middle East pledged $32bn to a foundation.